Our proprietary, copyrighted technology has merged with our old fashioned customer service. Together they add up to a superior performance quotient for all existing cleaning and maintenance services. Only The Arthur Jackson Company has iMOPS and we are making it available exclusively to our customer base. Contact us at imops@arthurjacksonco.com to setup a presentation on what surely is the most comprehensive client driven system for cleaning and maintenance - anywhere. 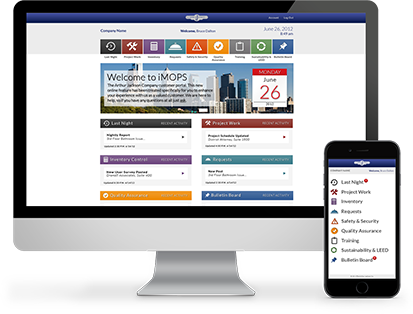 The iMOPS system is a trademark of The Arthur Jackson Company, 2016. Interested in learning more about iMOPS? Contact us today to set up a presentation on what surely is the most comprehensive client driven system for cleaning and maintenance — anywhere. Click on the button below to log-in to your iMOPS account.